The station is at the end of a long drive with railway gate posts remaining at the start of the drive. The main station building is now in private occupation and remains largely unaltered. Although the canopy and iron pillars remain; they have been boxed in to form a conservatory. There is little evidence of the up platform, while the down platform is now very degraded having had its edge stones removed many years ago. A brick weigh office stands just beyond the station forecourt at the entrance to the goods yard. The house is occupied by coal merchant J H Wright and Son who are still trading from the yard, with the coal drops still in use although now de-roofed. Notes: The station was originally called Gate Helmsley. 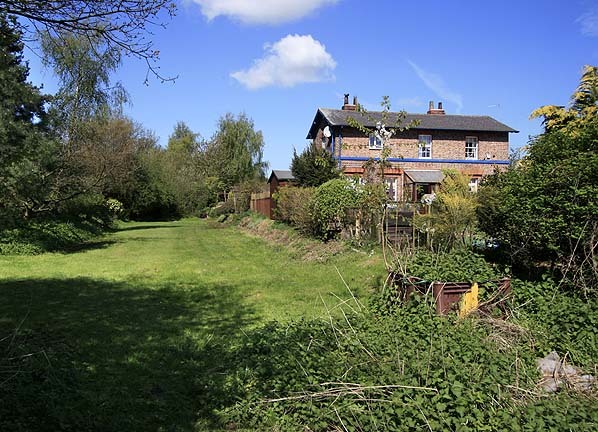 Although the York - Market Weighton line opened on 4th October 1847 Gate Helmsley station was a later addition. A station was promised by the directors and was due to open in May 1848 although it did not appear in public timetables until June 1848. The station was renamed Holtby on 1st February 1872 as part of the NER policy of renaming stations whose name might have been confused with that of another station. The village of Gate Helmsley is half a mile south of the station while Holtby is nearly 3 miles away! Holtby was approached through a cutting from the west with one of the few road bridges on the line. The station had two facing platforms. 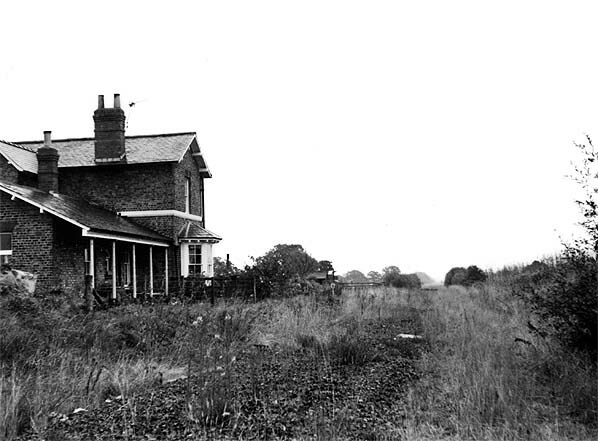 The main station building, which incorporated the stationmaster's house and booking office, was at the west end of the down platform and was a typical G T Andrews structure similar to that at Stamford Bridge; it seemed unnecessarily large for a station serving such a small population. It comprised a two-storey 'L' shaped brick house, end-on to the platform, with a ground floor bay window overlooking the platform. 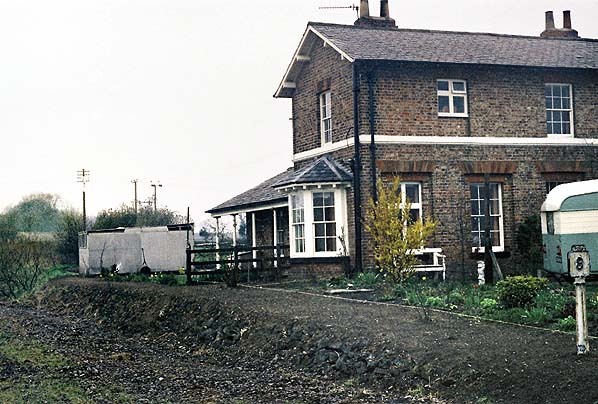 A single-storey brick extension housed the booking office and waiting room; it was recessed under the overhanging roof which formed a short canopy, supported on five iron pillars. A timber waiting shelter, built to the standard NER design, was sited on the up platform. A signal box was sited at the east end of the up platform. This controlled access to the small goods yard opposite. The yard comprised two sidings, one running parallel with the main line behind the down platform and the other serving coal drops. There was a long drive from the road to the station. Just beyond the station forecourt a weigh office and weigh bridge marked the entrance to the goods yard. The station did not handle livestock. In 1911 the population of the station’s catchment area was 1015. 4,813 tickets were sold that year, and the main freight handled was potatoes, with 650 tons being dispatched. and a junction with the Selby line at Gascoigne Wood, with the remaining section to Normanton opening on 1st July 1840. A spur to Methley Junction, giving access to Leeds via a working arrangement with the North Midland, was opened on 27th July 1840, followed by a southbound curve from the Leeds & Selby at Gascoigne Wood. The line was extended southwards to Burton Salmon by 11th May 1840, with another short chord to the junction with the Leeds & Selby opening on 9th November 1840.
coloured light signalling was installed at Market Weighton and near Stamford Bridge. Steel sleepers were laid between Market Weighton and Kipling Cotes. Warthill, Fangfoss and Cherry Burton closed in 1959. The introduction of Cravens diesel multiple-units saw a general speeding up of the service, with nine trains per day calling at the remaining stations. The accelerated service proved popular, but this upturn in fortunes was to be short-lived. Tickets from Michael Stewart, Bradshaw from Chris Hind, route map drawn by Alan Young. Thanks to Sean of Selby (Flickr photostream) for providing transport on 4th May 2020 at short notice. 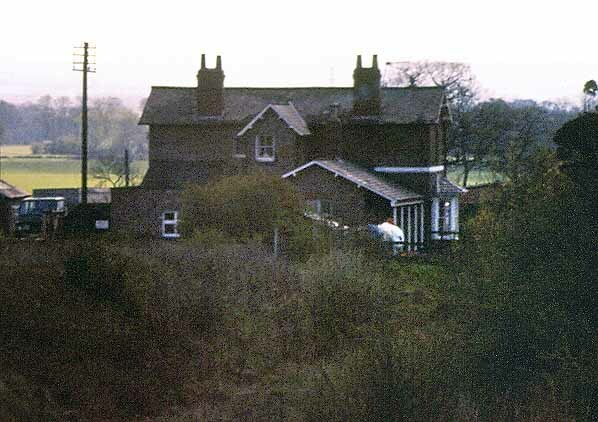 Holtby station looking south east in August 1971..
Holtby’s main station building on the down platform in April 1977. Holtby station looking north west in May 2010. 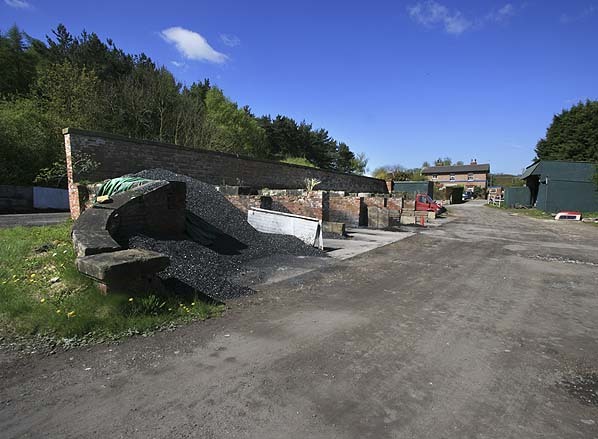 Holtby coal drops in May 2010.